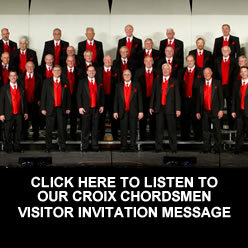 The St. Croix Valley Chapter has an open door policy for anyone who wants to experience the thrill of singing good Barbershop Harmony with an inspired bunch of guys that have a very enthusiastic and talented Director. Listen to all past Shows and Celebrity Messages here! 2017 © Copyright St. Croix Valley Croix Chordsmen Chorus All rights reserved.